SignTracker is for realtors to assist them in placing and keeping track of the locations of Open House signs. 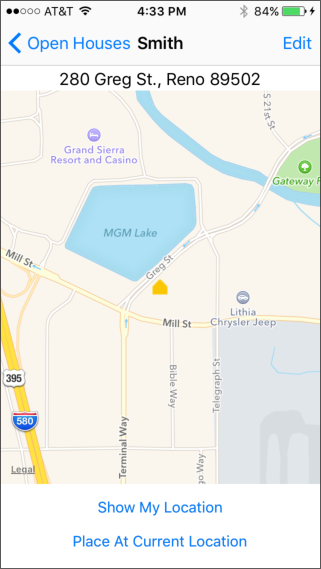 The App allows any number of open houses. For each open house there is a name, address, date/time and number of visitors. Signs are assigned to each open house. The open house and the signs are displayed on a map. 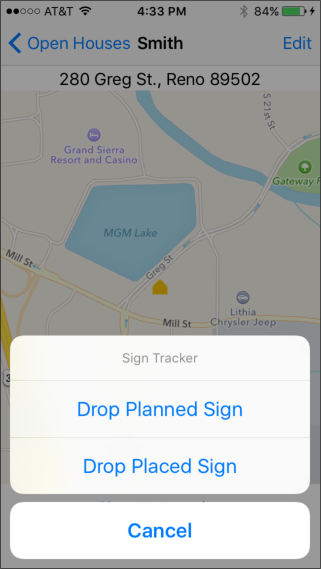 SignTracker lets you plan the location of signs and then place the signs at the locations. You can also drive around and drop a sign at your current location. When signs are picked up, the locations can still be viewed for future reference. Open houses and signs are not deleted until you delete them. This is where all the open houses will be displayed. Touch the Add button to add a new open house. 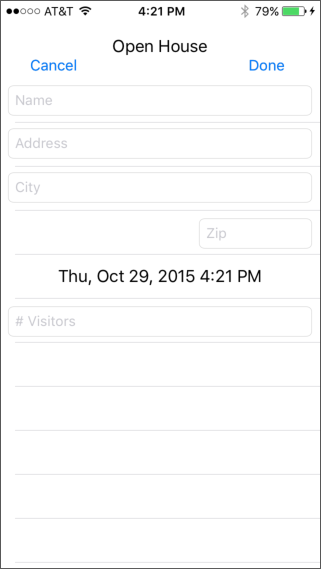 Enter a name, the address and set the date/time. Sample information for a new open house. Touch Done to save the new open house. 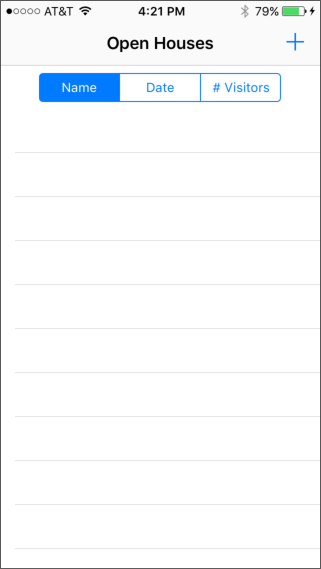 Touch Cancel to exit without saving. The new open house is displayed. 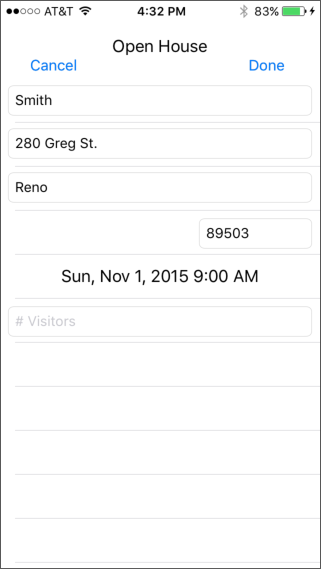 The Name, Date and # Visitors selections at the top of the screen will change the order in which the houses are displayed. Touch the open house to display the map for this open house. The initial map display shows the location of the open house. 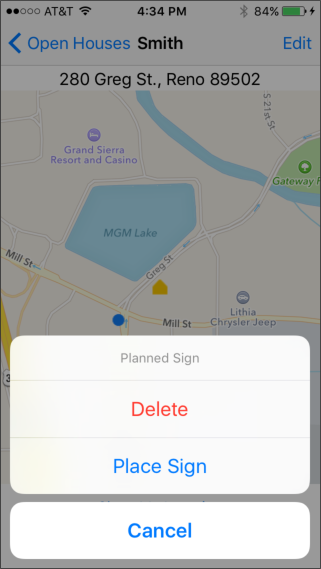 Touch the map to drop a planned or placed "Open House" sign. Touch Show My Location to show your current location on the map. Touch Drop Planned Sign to show a location where you plan to place a sign. Touch Drop Placed Sign to show a location where you have placed a sign. Here is the map with a planned sign. Planned signs appear as blue dots. Touch Place Sign to place a sign at the location. Touch Delete to remove the sign from the map. The planned sign has now been placed. Placed signs appear as green dots. Touch Pick Up Sign to indicate the sign has been removed. Signs that have been picked up are shown in purple. This is so you can see where signs were placed when reviewing previous sign placements. If you touch a picked up sign, you have the option of placing it again or deleting it. Touch Edit from the map screen to edit the open house information. You can change the open house information and also add number of visitors. 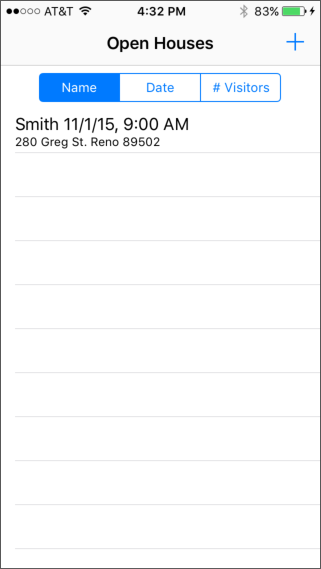 Use the Delete button on this screen to delete the open house and all signs. This action cannot be undone.